Not Getting Results from Digital Marketing? Srinath is the Founder & Director at Opteamize. He has over two decades of consulting in Services and Manufacturing companies in the US and India. He manages the overall digital marketing process, including content & SEO strategy, branding, promotion, lead generation, revenue growth, and business advancement possibilities for the customer. Tech Advisor – Dr. Srikanth Sundararajan is a Partner with Ventureast, and works closely with the Ventureast Proactive Fund’s portfolio to help them scale their business operations. He brings with him over 25 years of innovative IT and entrepreneurial experience with leading technology firms in India and the US. 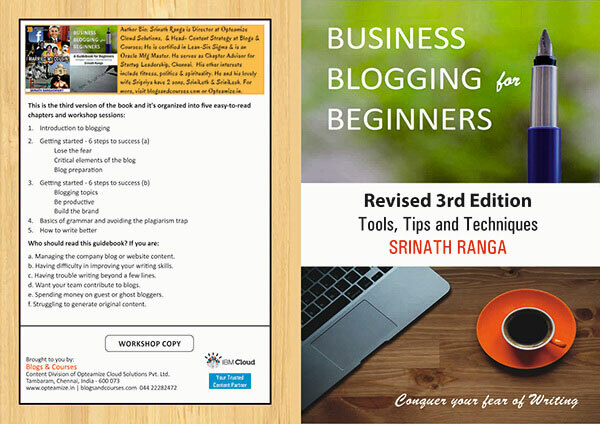 Please allow me the opportunity to recommend Srinath Ranga. Srinath demonstrated excellent communication skills between all parties involved in each financial transaction with consistent professionalism. I recommend Srinath Ranga without reservation. If I may be of further assistance, please don't hesitate to contact me at ljennings@amstatcapital.com. Srinath was well-organized and demonstrated a good understanding of MES system functionality and requirements. His leadership on the project helped us to reach the correct business decision for our plant. I found Srinath to be highly intelligent and competent. He was very engaged in our joint projects where he demonstrated organization, leadership, and reliable performance. He brought a high level of energy and many good ideas. And, most important to me, he was very personable and easy to work with. I have enjoyed my association with him over the years since we first met. This is the fourth version of the book and it is organized into five easy-to-read chapters and workshop sessions: You can read the entire book below right for free! Want to learn blogging? Join our Digital Marketing Course.